Rural medical area - the complex of treatment-and-prophylactic institutions providing medical care to the rural population. In the composition of rural medical site is a rural district hospital (or clinic), medical, medical-obstetrical centers, rural health centers, enterprises and state farms, located on the territory of the plot, farm maternity home, seasonal and permanent nurseries, nursery-gardens. All medical institutions of rural medical stations organizational United and work on a common and comprehensive plan under the guidance of head of section - chief physician of rural district hospitals or clinics (figure). The structure of rural medical area and its relation with the regional medical institutions (scheme). The main health-care establishment of rural health area is a rural district hospital (or rural health clinic). Its power depends on the radius of the service, abundance and population density, distance to the Central district hospital, availability of industrial enterprises and the local conditions. In power there are 4 categories of rural district hospitals. In the hospital I category (75-100 beds) provides specialized berths in therapy, surgery, Pediatrics, infectious diseases, tuberculosis, and midwifery. In rural local hospital in the II category (50-75 beds) should be berths in therapy, surgery, Pediatrics, infectious diseases and midwifery. In the hospital of III category (35-50 beds) provides berths in therapy for adults and children, surgery, infectious diseases and midwifery. In the hospital of the IV category (25-35 beds or less) should be berths in therapy, surgery, and midwifery. Currently, in most areas of rural district hospitals with a capacity of less than 25 beds escalated or reorganized in medical outpatients, with the exception of the Extreme North and some others, with low population density. The main functions of rural medical area are rendering treatment-and-prophylactic help to the population and carrying out of sanitary-anti-epidemic work. One of the main sections of the rural health work area - organization of outpatient care as the most mass kinds of medical aid. Outpatient medical aid to the population of the area is mainly in the local hospital. The doctors of the hospital are outpatient reception of adults and children served by patients at home and provide emergency assistance around the clock, which provides alternate duty. In cases of temporary absence of a doctor or a large number of references to the reception of patients attract medical assistant. In addition, in order to bring medical care to the rural population living on the periphery of the area in the largest rural medical stations converted to a medical clinic providing therapeutic and pediatric care and rural health posts are organized medical counseling techniques. First aid on the periphery of the plot is provided first-aid stations (see). More and more widely used medical examination (see).THE organizing and conducting medical examination of the population area main role belongs to the rural local hospital. 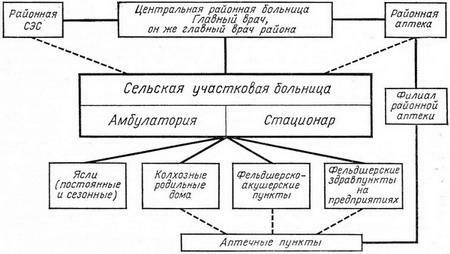 Doctors hospital plan of carrying out of prophylactic medical examination, take account of the persons subject to examination and leaders of agricultural production, machine operators and cattle breeders, employees who have contact with pesticides and other harmful substances; carry out preventive measures stipulated by corresponding instructions about check-UPS.